An inquest into the Charleville twins’ horrific death last year has been held. TWIN NINE-YEAR-OLD boys attacked by their older brother in Charleville, Co Cork sustained more than 40 stab wounds each. 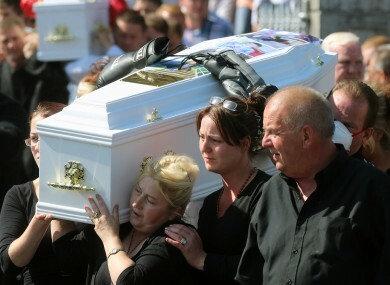 The wounds were inflicted by their brother Jonathan O’Driscoll (21) who took his own life less than an hour later. The boys’ mother Helen O’Driscoll said the family is devastated and called on anyone suffering to seek help. “We are broken-hearted. Every day is like a million years and I suppose it will be like that for the rest of our lives,” she said. If I had one message for any children, boys and girls, adults out there suffering with depression and sickness, don’t wait for their parents to be sick and broken-hearted like us. “There is somebody out there that will listen to you. For God’s sake, before your parents end up like us, get that help while you are able,” she said. The bodies of twins Paddy and Thomas O’Driscoll were found in separate bedrooms at 3 Deerpark, Charleville just before 5.15pm on 4 September 2014. At 6.30pm, the body of the twins’ older brother Jonathan was found at the banks of the Awbeg River in nearby Buttevant. Two knives were found in the centre of the river. The inquest heard how Paddy O’Driscoll tried to fight for his life resulting in wounds ‘classed as defensive’ according to Deputy State Pathologist Dr Michael Curtis. Paddy sustained multiple stab wounds to his lungs, heart, trachea and jugular vein. Thomas sustained multiple stab wounds to his back and left side, one wound measured 7cm in depth. Jonathan had collected his four younger brothers, twins Paddy and ‘TomTom’ and Jimmy (5) and Martin (4) from crèche at 3.15pm that day. He brought them to the park and bought them sweets before driving them home. Neighbour Michael Stokes was working outside when he was approached by one of his young neighbours. “Small Jimmy walked over to the ditch and said ‘my brother killed my brothers,’” Mr Stokes said. Garda Owen Boyle received an emergency call from another neighbour, Tommy Meehan ‘in a distressed state’ at 5.15pm. In the days before the attack, Jonathan conducted a number of online searches that gave Gardai an indication of his ‘state of mind,’ according to Detective Superintendent Sean Healy. A number of notes were found but were not read out because their contents were deemed too disturbing. The inquest heard how doctors became concerned for Jonathan’s mental health and he was prescribed anti-depressant and anti-psychotic medication. However, a postmortem revealed no evidence of medication in his system. Consultant psychologist Dr Robert Burns said the medication had helped Jonathan. “But like many young men he stopped taking the medication and became unwell again prior to his death,” Dr Burns said. “The family did everything in their power to assist Jonathan,” the jury foreman said. Helen O’Driscoll said the inquest had helped clarify events. “It’s a step more for us to get on with life, at least now we know what happened and we know there is no one really to blame only the good God up there that wanted him,” she said. Coroner Dr Michael Kennedy said the family had endured a devastating tragedy. “Words can’t describe the horror your family has had to face, it was a normal day like any other… to return to a scene of horror that none of us can imagine is devastating,” the coroner said. He thanked Gardai for their work on a ‘harrowing job’ and thanked Jonathan’s medical team whom he said are deeply affected by the tragic outcome. The coroner’s court heard today how one garda has been unable to return to work since witnessing the aftermath of the events of that ‘terrible day’. Email “Paddy O'Driscoll's defensive wounds show he fought for his life, inquest hears”. Feedback on “Paddy O'Driscoll's defensive wounds show he fought for his life, inquest hears”.